The Fujifilm Finepix S8100fd (announced 24 January 2008) is a 10 megapixel camera with integrated 18x wide angle optical zoom lens (27mm-486mm equivalent). The Finepix S8100fd also features dual image stabilization, 2.5 inch wide screen LCD, intelligent i-flash feature, ISO up t0 6400, 13 scene modes, as well full manual photographic control. 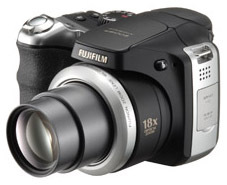 The Fujifilm Finepix S8100fd will hot stores in March 2008 at a retail price of $399. FUJIFILM U.S.A., Inc. today announced the launch of the long zoom, SLR-styled FinePix S8100fd digital camera. Perfect for photographers seeking a step-up digital camera, Fujifilm’s FinePix S8100fd combines user-friendliness with long-zoom flexibility and high speed shooting modes that are rare at the consumer level and perfect for great action shots. Continuing on the success of the wide-angle, long zoom FinePix S8000fd, the 10-MegaPixel FinePix S8100fd integrates a Fujinon 18x Wide Angle Optical Zoom fixed lens, which offers a 27mm-486mm equivalent and allows the user to achieve greater range than ever before. The sealed, fixed-lens system prevents dust contamination and eliminates the need for additional zoom or wide angle lenses, making it an easy-to-use, affordable alternative to the complex D-SLR system. Fujifilm’s innovative face detection technology, recognized with a 2007 ‘Best of What’s New Award’ from Popular Science Magazine, has enabled a number of advanced features that advanced consumer photographers will enjoy. Face Detection operates by identifying and prioritizing up to 10 faces in a framed scene and then adjusting the focus and exposure accordingly to ensure the sharpness and clarity of human subjects in the picture, regardless of background. After the shot is captured the automatic Red Eye Removal feature instantly checks each detected face for red eye and if it’s found, corrects it in the camera automatically, saving the time-consuming process of fixing it in your PC after the image is downloaded. A new Instant Zoom function captures moving subjects at high zoom settings. After zooming on a subject, a single button gives an additional 1.4x or 2x digital zoom at the center focus region of the frame. Zoom Bracketing performs a similar action using Fujifilm’s face detection technology to lock its zoom action on a subject’s face automatically as it enters the shot. Like the FinePix S8000fd, the FinePix S8100fd features Fujifilm’s Dual Image Stabilization, a marriage of mechanical sensor shift stabilization, to steady the photographer’s hand, with Fujifilm’s Picture Stabilization Technology, which uses fast shutter speeds and ISO levels of up to ISO 6400 (at 5 MegaPixels) for total anti-blur protection. As a result, an increase in clarity and sharpness is achieved, even in low light conditions. A Continuous Shooting Mode makes it easy to shoot moving subjects like pets and kids. This new feature allows high-speed shooting of up to 33 frames at 13.5 frames per second (at 3 MegaPixels; 6.8 frames per second at 5 MegaPixels). And with high speed playback at 10 frames per second you can be sure you’ve captured all of the action. * i-Flash: i-Flash Intelligent Flash detects subtle lighting differences within a scene and then varies the flash intensity accordingly. It also leverages the high sensitivity of the FinePix S8100fd to enable the camera to use less flash, resulting in an image that displays pleasing, natural tones without a washed-out effect. And with an automatic pop-up flash, it’s always ready when you need it. * Full Manual Photographic Control: Photo enthusiasts and advanced photographers have total control with manual adjustment options for various camera settings including resolution, ISO, aperture, shutter speed, and more. * Scene modes: A wide range of 13 pre-programmed scene modes provides top-quality photos in a variety of shooting conditions. * Dual Shot Mode: In this mode, the FinePix S8100fd quickly shoots two images in succession – one with and one without flash – saving both. This convenient function lets the user perform an on-the-spot comparison and decide whether the FinePix S8100fd produced the most pleasing photo with flash, or without. * Movie Mode: VGA quality 30 frames per second with sound. * High Resolution LCD: The 2.5" Wide View LCD display offers 230,000 pixels of high resolution with a 60 frames per second refresh rate for smooth viewing. * Electronic Viewfinder (EVF): In addition to framing your shots with the 2.5" high resolution LCD, the S8100fd also offers a high resolution electronic viewfinder to eye up the best shot with an astonishing 60 fps refresh rate for smooth viewing. * xD / SD / SD-HC Compatible slot: A single media slot accepts not only Fujifilm’s traditional xD-Picture Cards but also Secure Digital (SD) and SD-High Capacity (SD-HC) cards too. * Operates on 4xAA Batteries: The ultimate in convenience and accessibility, using AA batteries means in a pinch, more batteries are just moments away. "This is a work-horse camera for photographers who want the convenience of an SLR-like model, a powerful zoom, high-speed continuous shooting and the ease of use that is often relegated to more compact models," said David Troy, senior product manager, Consumer Digital Cameras, Electronic Imaging Division, FUJIFILM U.S.A., Inc. "The bonus that comes with the S8100fd is the set of features made possible by Fujifilm’s advances in Face Detection and Dual Image Stabilization technology." The FinePix S8100fd will debut in March 2008 at a retail price of $399. This entry was posted in Fujifilm and tagged Fujifilm, Fujifilm Finepix, Fujifilm Finepix S Series on March 11, 2008 by jonathanb.